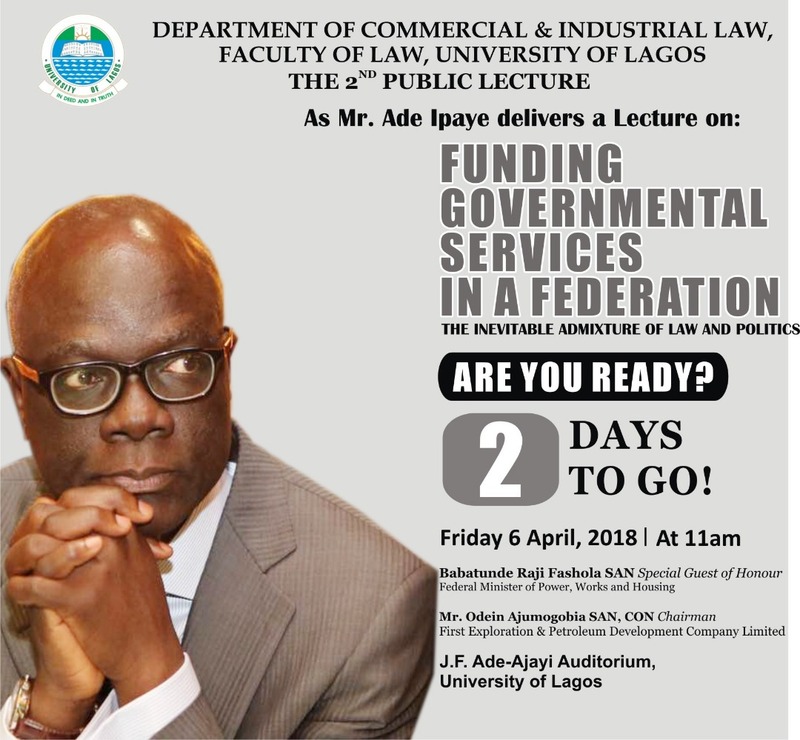 Ade Ipaye, the Deputy Chief of Staff to the President of Nigeria will on Friday, April 6, 2018, deliver the 2nd Public Lecture of the Department of Commercial Law and Industrial Law, University of Lagos. 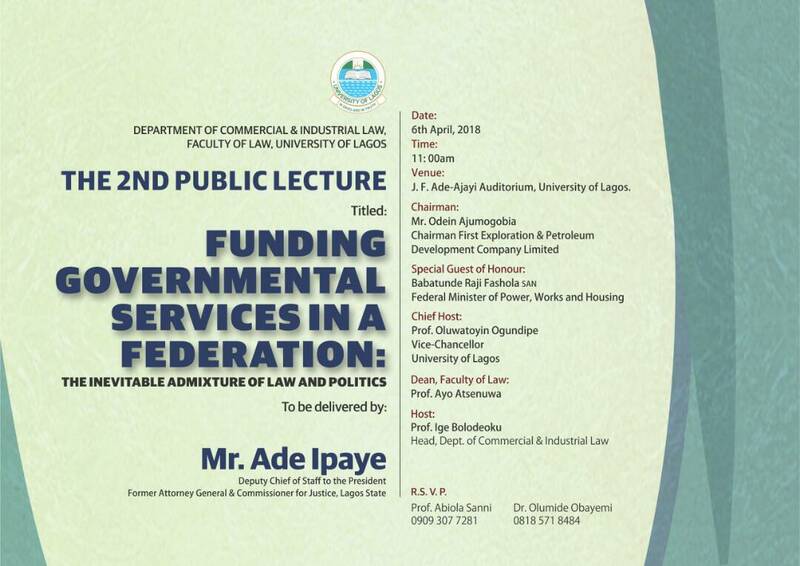 Ipaye who was formerly the Attorney General and Commissioner for Justice, Lagos State and Special Adviser to the Governor of Lagos State on Taxation & Revenue is scheduled to speak on Funding Governmental Services in a Federation: The Inevitable Admixture of Law and Politics. 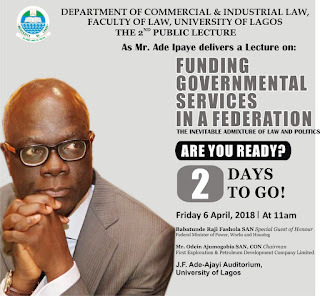 The Minister of Power, Works and Housing, Babatunde Fashola, SAN is the Special Guest of Honour while another Senior Advocate of Nigeria, Mr. Odein Ajumogobia, former Foreign Affairs Minister will chair the event. The President of Dangote Group, Alhaji Aliko Dangote; and the Chairman of Forte Oil Plc, Femi Otedola will be special guests. Prof. Ige Bolodeoku, the Head of Department of Commercial and Industrial Law, said Ipaye would examine sources of funding to government from legal and political perspectives, as well as their adequacy and opportunities. The lecture will hold at the J. F Ade-Ajayi Auditorium by 11.00am. This is one of those behind the scene masters. A scholar par excellence. Wishing him all the best I all his endeavors. Your write-ups are exceptionally educative - particularly for some of us who are very keen to know more about the history of our dear country. Regrettably, I think the quality of the content of some of your very recent stories (for instance this Ade Ipaye lecture notice) is at variance with the high standards you have set for yourself in your earlier write-ups. We want more interesting and educative stories. Thank you, Yemostica. This is a notice about a public lecture on a subject that is very topical. It's another of Onigegewura's contribution to education and enlightenment. Onigegewura is not all about History. Our focus is CHLAPP [Culture, History, Law, Arts, People and Politics]. I appreciate your observation.